Royal Caribbean cruise ships offer travellers the absolute best in cruising, no matter which ship you choose. With several ships having been refurbished, and their newest class of ships recently launched, Royal Caribbean show that innovation and imagination knows no bounds. Royal Caribbean cruise ships are ever-changing as they push the cruise envelope to broaden everyone’s horizons. Take for example the Royal Caribbean Jewel of the Seas. Here is a ship that offers the best in Radiance class with floor to ceiling windows, a glass atrium and glass elevators that face the sea. This ship is built with the best views in mind at all times, the glass, glass and more glass means that you are never far from a beautiful view, even when going from deck to deck. Add the amenities that Royal Caribbean is known for like the rock climbing wall, Broadway style shows, spa and casino with the 16 bars and lounges onboard and you have a ‘radiant’ trip awaiting you. 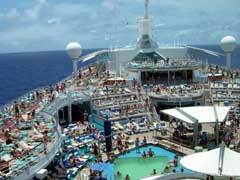 Another in the Radiance class is the Royal Caribbean Radiance of the Seas. This ship offers panoramic views with the floor to ceiling windows and a 9 storey central atrium encased in glass. Like its sister ship the Jewel of the Seas, the elevators face the sea to maximize your views. This ship has been recently renovated and has had 8 new dining experiences added. You can also enjoy the jogging track, rock climbing walls, mini golf and a video arcade while onboard. The Royal Caribbean Adventure of the Seas is a ship in the Voyager class that offers adventure and activities for all members of your party. This ship has the rock climbing wall of its sister ships, and of course pools and splash areas, but also includes an ice skating rink, an in-line skating track, a golf simulator, basketball and volleyball courts and the Royal Promenade. Its 15 decks, 10 pools and whirlpools and 15 different clubs and lounges make for a perfect adventure at sea, before you even get to your destination. The Royal Caribbean cruise ships innovation and ingenuity can be seen best on the Allure of the Seas, Royal Caribbean’s newest ship. This ship is in the Oasis class and offers all the amenities of its sister ships, along with a new concept in sailing: the neighborhood. Each of the 7 distinct neighborhoods on board is its own little community, each with touches that make each one special. Add to this the Aqua Theater where you can enjoy water shows and high diving performances, the first Starbucks at sea, the zipline, the two Flow Rider surf simulators, the Royal Promenade and the 25 places to eat and you have a vacation destination unto itself. This ship also boasts the first living park at sea, a boardwalk with shops and a full sized carousel and over 2,000 staff to cater to your every need. Of course, there are also the shows, the spa and the solarium for adults only time. Royal Caribbean cruise ships offer you a vacation to remember and remind you that getting there is half the fun!